The story of Sendratari Ramayana is about rescuing Dewi Shinta (or Sinta) that’s kidnapped by Rawana. A competition was being held by Prabu Janaka, the King of Mantili Kingdom, to find the right person to marry his daughter, Dewi Shinta. 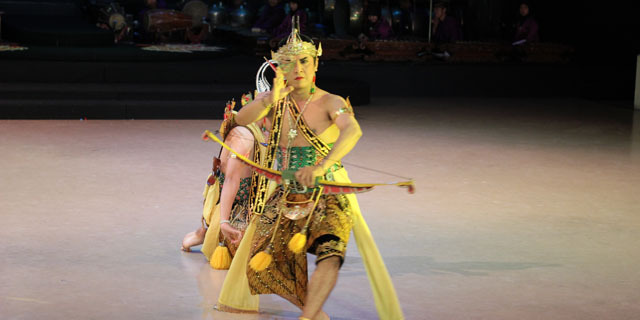 Rama Wijaya, as the Prince of Ayodya Kingdom won the competition. In the mean time, Prabu Rahwana, the ruler of Alengkadiraja Kingdom, wanted to marry Dewi Widowati. Then he saw Dewi Shinta, which he thought she’s the reincarnation of Dewi Widowati. One day, Rama and his wife, Shinta, accompanied with Rama’s brother, Leksmana, went out to do some adventure until they reached Dandaka Forest. Somehow Rahwana saw Shinta in the forest and eager to possess her, so he told one of his follower, Marica to change himself into a golden deer (Kijang Kencana) to attract Shinta. 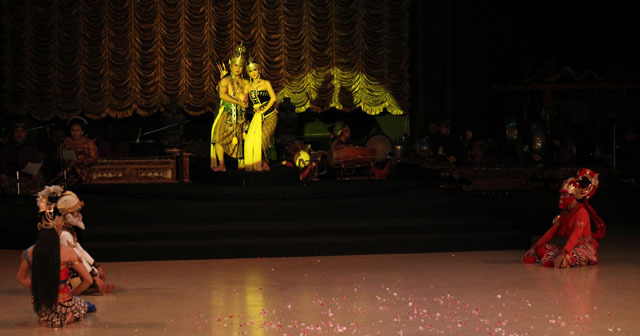 Shinta interested with the deer and asked Rama to catch it, so Rama went to catch it and leave Shinta with Leksmana. Worried that Rama went too long, she asked Leksmana to look for his brother. Before he left, he made a magic circle around Shinta to protect her. When Rahwana realized that Shinta was left alone, he tried to kidnap her, but he failed because of the protection from the magic circle. Then he turned himself into an old beggar to ask for compassion from Shinta. As soon as Shinta came out from the circle, he kidnapped Shinta and took her to Alengka Kingdom. After Rama shot the deer with the magic arrow, the deer suddenly transformed into a giant (Marica). A fight happened, and Rama shot the giant with his magic arrow. 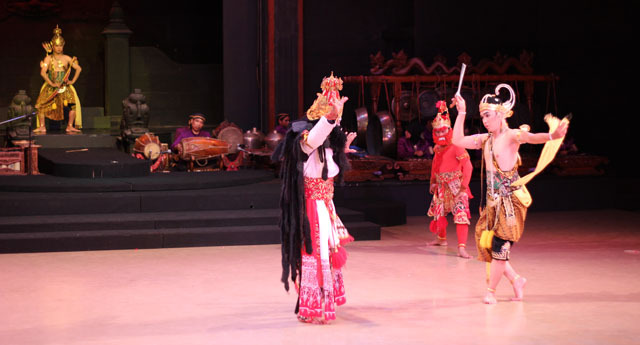 Soon after Leksmana found Rama, he asked him to return to Shinta’s place. On their way to Alengka, Rahwana met a bird named Jatayu. 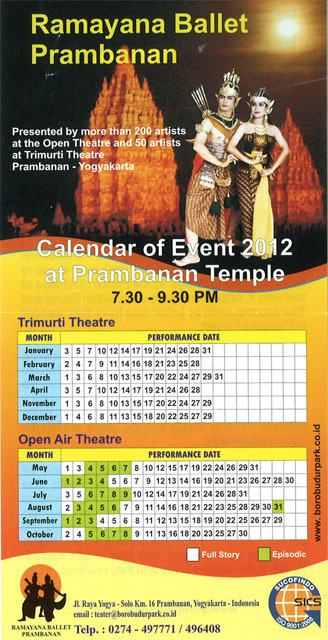 Jatayu then quickly noticed that Shinta was the daughter of Prabu Janaka. He then decided to rescue her, but then he was defeated by Rahwana. In the mean time, after Rama and Leksmana couldn’t find Shinta in her place, they then searched for her. Instead of finding Shinta, they found the wounded Jatayu, and Rama quickly thought that it’s Jatayu who kidnapped Shinta. He almost killed Jatayu, but then Leksmana stopped him. Jatayu explained what just has happened and then he finally died. Not long after that, a white monkey, called Hanuman, came. He’s looking for two warriors who could defeat Subali, a person who’s taken Dewi Tara, Sugriwa’s (Hanuman’s uncle) beloved woman. Rama agreed to help him. 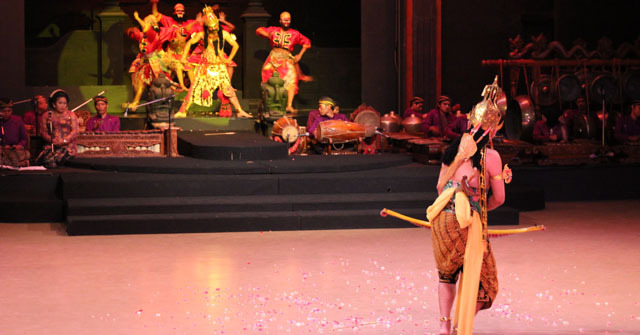 When Subali, Dewi Tara and his sons were chatting, Sugriwa and Rama arrived and attacked him, then he rescued Dewi Tara. Subali then sent Hanuman to help Rama in finding for Shinta. When Rahwana’s niece, Trijata, calming Shinta in the garden; Rahwana arrived and asked Shinta’s to be his wife. Shinta refused, and made him angry. He wanted to kill her, but stopped by Trijata. She said that Rahwana should be patient. She also would take care of Shinta. Suddenly, Shinta heard a beautiful song, sung by Hanuman. Then Hanuman explained that he was asked by Rama to rescue her. He then destroyed the garden, but was captured by Indrajid, Rahwana’s son. Hanuman then was sentenced to be burnt alive, but what happened next was Hanuman with the body full of fire burnt Alengka Palace. After delegating Hanuman, Rama and the ape troops made a bridge to Alengka. When the bridge was finished, Hanuman came and reported about the situation in Alengka. Rama then commands Hanuman and the ape troops to attack Alengka. The big war occured between the Rama’s side and Rahwana’s. Indrajid was killed by Laksmana in the war. And finally in this war, Rama killed Rahwana using his arrow. After Rahwana gone, Hanuman brought Shinta to Rama, but Rama refused her because he thought Shinta was not pure anymore. In order to prove her purity, she burnt herself. With the help of God of fire, Shinta was saved from fire. This made Rama happy and finally accepted Shinta.